Ormond performs R&D, applied engineering, process and tooling development, and advanced manufacturing services in high-pressure technology applications. We carry out large and small commercial and Government funded projects to develop and implement advanced high-pressure technologies that address a broad range of applications. Founded in 2000, Ormond is a recognized leader in advanced high-pressure research. The management and engineering staff have more than 20 years of experience performing high-pressure and waterjet related research. Our extensive experience in developing and implementing specialized high pressure technologies has been key to the creation of several enabling manufacturing technologies. R&D: Government and Commercial contract research is performed to develop new technologies that address a range of high-pressure and manufacturing applications. Production: Ormond provides specialized in-house manufacturing services or can set up our customers to use advanced technologies in their own plants. The Ormond facility houses five precision waterjet workstations, four of which are equipped with large 5-axis robots. 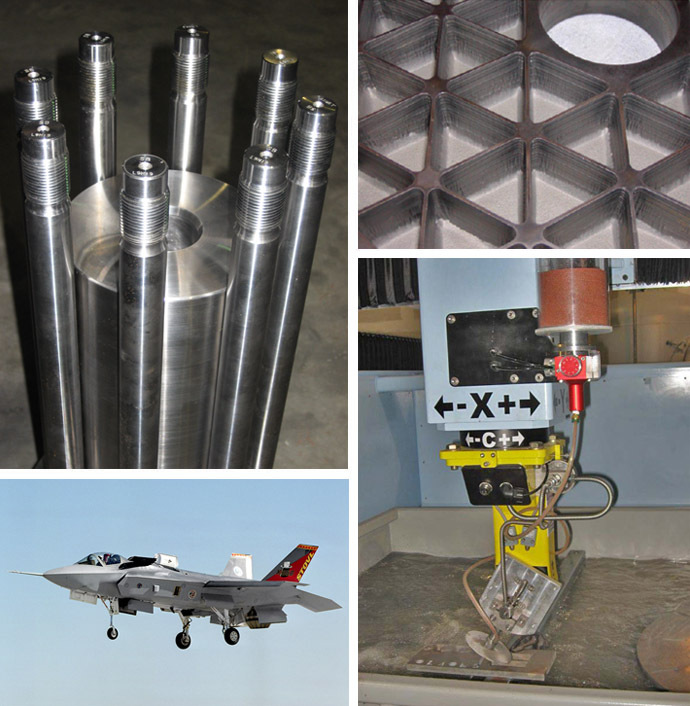 Services: Ormond provides contract engineering services, supplying customers with custom tooling, software and processes. Ormond conducts large and small contract engineering and R&D programs for commercial and Government customers. Specialized high-pressure technologies and apparatus are developed at Ormond to address a broad range of market areas, such as manufacturing, energy, instrumentation and materials. The Ormond engineering staff has been instrumental in developing some of the most advanced abrasive waterjet manufacturing technologies available today. Our technologists provide process optimization, custom software, and specialized waterjet tooling that can make a tremendous difference to profitability in many applications. Ormond specializes in difficult or advanced waterjet machining processes, making it possible to generate complex components from difficult materials. The technologies available at Ormond often make it possible to reduce manufacturing costs and open up design options in applications that otherwise rely on methods such as electric discharge machining (EDM), and chem-milling. 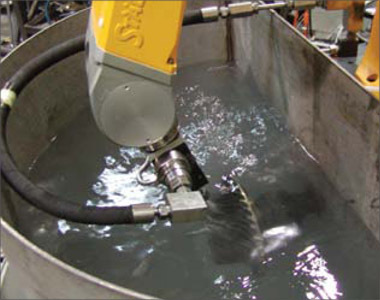 Many unique waterjet-machining technologies that can not be performed with commercially available tooling or methods are made available at Ormond through in-house contract machining services. Ormond has large precision 5-axis machines available to implement special technologies. The abrasive waterjet can be used to drill holes in difficult materials such as Inconel or ceramics. 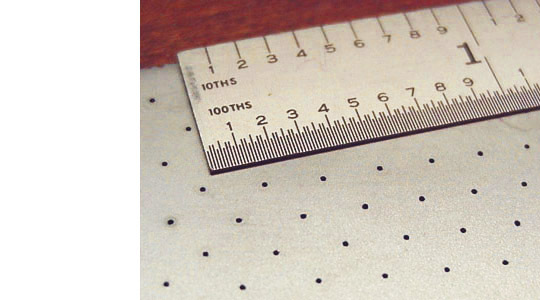 Ormond's engineers have developed specialized hardware and processes to drill holes as small as 0.0075 inches in diameter. The abrasive waterjet can be used to drill holes at shallow angles through coated materials such as thermal barrier coated jet engine parts. A common advantage of the abrasive waterjet drilling process is the improved fatigue performance and improved hole repeatability. In addition to drilling shaped holes, the abrasive waterjet drilling process is capable of drilling deep holes through difficult to machine materials. An example of a high aspect drilling application at Ormond is 0.084+/-0.004 inch diameter in 3-inch thick heat treated 15-5 stainless steel. The patented Ormond abrasive waterjet machining technology is used to mill controlled depth channels and pockets in challenging aerospace and high temperature materials. A proprietary software package makes it possible to mill complex shapes into contoured surfaces in materials such as nickel alloys, ceramics and tool steels. This has been an enabling technology in several difficult Air Force applications, making it possible for engine developers to push the envelope with their designs. space optics to tiny heat exchangers and rocket combustors. Cavitation peening is a new technology that can generate high magnitude deep compressive stresses in metals and ceramics without roughening the surface of the part. It is used to improve fatigue resistance and increase the size of material flaw that can be tolerated in fatigue prone components. It was shown to significantly increase impact fracture damage resistance in brittle components. Hydraulic tubing peened by Ormond for the V-22 demonstrated increased fatigue life from less than 25,000 cycles to greater than 500,000 cycles. This low cost process is capable of creating residual stresses deeper than 0.040 inch and can be used to process very small stress-concentration features, such as between gear teeth and in thread roots. Cavitation peening does not require the use of shot of any kind, but uses only a jet of high velocity fluid to generate shock waves and create residual stresses. The peening intensity is easily controlled, by varying the process parameters. Conventional waterjets are not capable of providing satisfactory performance when machining some ceramics. Commercially available nozzles are limited by their wear resistance to abrasives that are aggressive enough to properly machine materials like alumina, boron carbide or silicon. However Ormond has developed a new ceramic composite nozzle that is 100 times more wear resistant than commercial nozzles when using abrasives that cut ceramics several times faster than commonly used garnet. 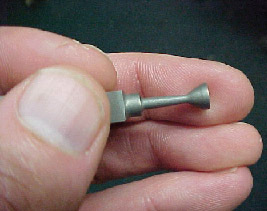 This nozzle wear resistance is key because wear would otherwise degrade the machining process control in only minutes. Ormond waterjet milling rates in silicon carbide are more than 10 times greater than diamond grinding and without generating damaging subsurface fractures. Commercial waterjet machine tool manufacturers sell high quality equipment for supporting common waterjet machining applications, but advanced waterjet cutting often requires specialized tools designed to a particular application. The engineers at Ormond are experts at designing custom waterjet tooling to meet difficult applications. Ormond designs and fabricates custom waterjet tooling and accessories to support the customer’s special needs. Custom machines: Customers come to Ormond because commercially available waterjet machines don’t always meet their specific requirements. The Ormond staff identifies the complex needs of individual customers and single or multi-axis, large or small close tolerance machines of can be built to their special needs. Professional CNC controllers are provided with these systems so customers can operate using the commercial CAD-CAM software to generate CNC programs in the same manner that milling machine code is generated. Ormond supplies custom post processors to generate waterjet CNC code using programs such as MasterCAM™. Production Tooling: The major players in the waterjet machine tool market supply a standard listing of waterjet components and machine tools in order to address the needs of a broad mix of customers. Ormond can provide support to customers who require custom tooling. Engineers at Ormond understand the needs of businesses that perform high volume production and custom made tooling is designed and fabricated in order to support the high efficiency operations necessary in high volume production. The ultrahigh-pressure (UHP) pump technology used to create high-velocity waterjets was developed in the 1970s. Water is pumped at pressures up to 90,000 psi and expelled through a sapphire orifice to form a fine, coherent cutting jet. At this pressure, the water is traveling at about 4,000 feet/second when it emerges from the orifice. Waterjets typically have diameters from 0.003 to 0.020 inch, requiring 2 to 90 Hp at 55,000 psi. Waterjets are generally used without the addition of abrasives to cut only soft materials such as food, paper products, cloth, leather, wood, fiberglass, and some aerospace composites. It is a valued technology in many applications due to the fact that it is easily automated and because of its ability to cut very thin kerf widths with little material loss. The capability of the UHP waterjet was extended in the early 1980s by adding abrasives to form the abrasive-waterjet (AWJ). The abrasive particles are entrained in the waterjet and transported at supersonic velocities to cut nearly any material. The AWJ has been shown to produce surfaces that are free from adverse mechanical, thermal, or metallurgical effects, and have found acceptance in cutting applications such as aerospace sheet metals and composites. The waterjet developed in the AWJ flows through a mixing tube where abrasive particles are entrained in the jet. The high-velocity water flow in the mixing tube creates a vacuum that serves to draw air, which is used to transport abrasives from a hopper into the nozzle via a supply hose. A second function of the mixing tube is to force a transfer of energy from the waterjet to the particles, while holding the accelerated abrasive particles in a narrow collimated stream. Garnet abrasives are commonly used as the AWJ cutting medium. The AWJ has many advantages over other machining technologies, but has remained a niche market in part because of limitations involved in machining to close tolerances. The capabilities at Ormond make it feasible to address closer tolerance work and take advantage of AWJ benefits over a broader range of applications.